It Took Ten Eps For A Masterpiece. Not that I’m going to spoil except in the spoiler space, but this is a show that has been accused of starting slowly. This is not wholly without merit. Although we, the viewers, know better, the villagers either suspect nothing, or believe that there is some sort of epidemic that must be kept quiet to prevent panic, and so forth. Only our main character, Natsuno, is tipped off early on that something different is at work here. Anyway, the bottom line is that the climax that takes place in episode 10 is simply not something that a normal story could have produced. In one blow, every bit of foreshadowing, building things up, creating tension with characters who know that there is no magic solution that will save everyone, and so forth, is justified in spades. But, I shall say no more outside of spoilers. 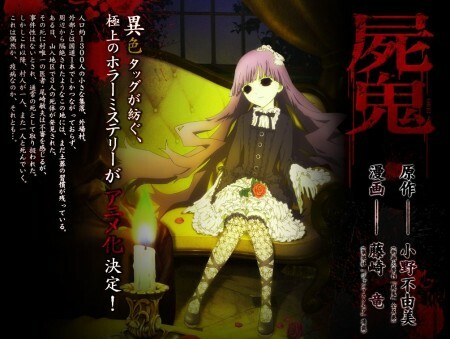 Since the beginning of the series, the first victim of the “mysterious illness” that Natsuno (usually called “Yuuki-kun”) knows personally, Megumi Shimizu, has been after him since “rising” from the grave and becoming a vampire, albeit we should not depend on “the rules” of vampires to apply perfectly. Having dug up her grave, and encountered a different vampire, Natsuno knows the truth, and so do a couple of other young villagers, for all the good it does them. Having knocked out a vampire attacker out cold (but not “dead,” as it turns out), Natsuno half-buried the body. In daytime, he returned to find the grave neatly set exactly as it was before they had dug up Megumi’s grave. Certain that both sides were now aware of each other, and having no way to take on the number of vampires on the other side, Natsuno essentially adopts a Castle Mode, determined to protect himself and his family as long as possible. He tells Akira and Kaori to not tell anyone that they have permission to enter their house, hoping that this protects them in the meantime. A child vampire manipulating a Geisha doll had arranged access at Natsuno’s own house with Natsuno’s far too trusting father. (In this show, the “shiki” require permission to enter a dwelling.) His brother is outraged when the room where the child had been given shelter, and then disappeared from, is covered with religious symbols. Indeed, later on when Natsuno gets a literal tap on his window, remaining silent while holding a wrench, he listens as the figure at the window – he knows it’s not Megumi (“Shimizu” to him) by the silhouette – goes to the front and tests the front door, finding it unlocked. See, when Natsuno’s family had moved to this village, his father was very impressed with the fact that this was a place where people didn’t have to lock their doors. Nice, unless a vampire is coming to kill you. Now, the immediate background to this is that Tatsumi Kanemasa, a “daywalker” who functions as the field commander for the vampires, summoned the newly turned and declared that Natsuno must die. Of course, Megumi is very cross about this. Furthermore, Tatsumi prevents her from being the one to go after him. She wants Natsuno bad, and it’s not just because she had a crush on him in life. It’s simple, really; only a low percentage of those killed actually rose from the dead. If Natsuno was drained, there would be no guarantee at all that he would rise, though Tatsumi seemed to think that the odds were higher than normal. If “Yuuki-kun” wasn’t going to make it into everlasting undeath, then at the very least, SHE would be the one to get her fangs into him. It’s funny. The metaphor writes itself. So, Natsuno wanted to capture the vampire after him and expose them to all of the villagers. Anyway, not that the viewers had seen this part before, and so it comes as something of a surprise, but the part that catches Natsuno completely flatfooted, and blows his mind away, is that the soft, intimate voice beyond the window is from his deceased best friend, Tohru. The wrench slips from his grasp. Tohru is the one person who Natsuno cannot raise a hand against, even in undeath. Knowing it may mean his own demise, Natsuno opens the window all the same, and Tohru makes a grab at his right arm. The two stare at each other, and Tohru breaks off and runs away, ashamed of himself. It is then that Megumi, who is knowingly defying orders, comes across the crying Tohru, having anticipated he would be the one to receive the order. She’s quite fine with letting him be and going to take Natsuno herself. Punishment or not, this is the depth of the emotion she has, even though she knows how truly frightening Tatsumi is, how he would think nothing of murdering his “own” kind in broad daylight, given a reason to. Natsuno chases after Tohru to a place that both know well, what appears to be a tiny shrine. Here, Tatsumi arrives, introducing himself properly, as they had not properly met before. Really, it was nothing personal, but Natsuno was a threat to Tatsumi’s kind, to their existence. Just like the doctor, Toshio, Natsuno had realized their existence. Unlike the doctor, Natsuno was causing them so much grief that he be eliminated here and now. Stating he had no obligation to just let himself be killed, Natsuno pledged to run with all his might, which Tatsumi thought was just fine, but there stood Megumi in his path of retreat. Actually, Tatsumi wasn’t all that broken up about it because he knew Megumi would disregard his orders anyway. Megumi was very pleased at having the opportunity to take the kill. Yet that was not to be. Suddenly, a hand moved around Natsuno’s mouth from behind, pulling him back with supernatural strength. Tohru had captured him, and it was Tohru’s fangs that struck home. The pure diabolical delight of Tatsumi. The pure agony on Megumi’s face. The pure despair of Natsuno. Ten episodes. One scene. One resounding climax. Rating: 10/10. I won’t say that for what preceded this, which I found interesting, but which many would have found slow-developing even as it got interesting, but this is nothing less than a horror masterpiece. But, I write these words for people like one friend of mine who watched two episodes and quit because it wasn’t moving fast enough. Also, for people who will never watch the show, or who genuinely don’t care about being spoiled. Really, it’s not what happened that impressed me, it’s not even why, it’s how, and making the moment count. I respect that as a writer. Anyway, those are my thoughts about it. Sorry that they are a little late, I have been a bit ill with a cold, but I hoped this would be interesting as an issue of culture, and not just entertainment. This entry was posted in Anime, Japan and tagged anime, impressions, Japan, rant, review, Shiki. Bookmark the permalink.